Swimming is not just for kids or vacationers at the beach. You can find Springmoor residents in the pool Monday through Saturday as they faithfully participate in water exercise. 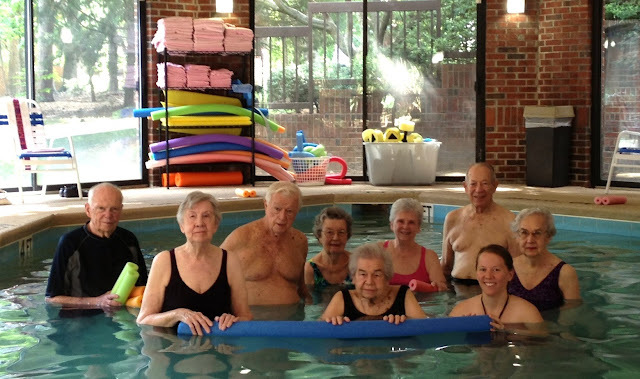 The residents are unique – ranging in age from 77 to 96—and living with various health conditions—ranging from arthritis and osteoporosis to hypertension and spinal stenosis and joint replacements; but they have one thing in common – they love to exercise in the water! I hope this inspires someone to find their bathing suit and to give the water a try. I am encouraged and blessed every time I teach in the water and get to spend time with amazing residents. Now that I’m halfway through my pregnancy, I get to experience the benefits of the water as well!